In the United Kingdom and Ireland coarse fishing refers to angling for freshwater fish which are traditionally considered undesirable as a food or game fish. Freshwater game fish are all salmonids—most particularly salmon, trout and char—so generally coarse fish, also known as rough fish, are freshwater fish that are not salmonids. There is disagreement over whether grayling should be classified as a game fish or a coarse fish. Fly fishing is the technique usually used for freshwater game fishing, while other angling techniques are usually used for coarse fishing. The sport of coarse fishing and the techniques it uses are particularly popular in the United Kingdom and mainland Europe, and as well as in some former British Commonwealth countries and among British expatriates. The distinction between coarse fish and game fish has no taxonomic basis. It originated in the United Kingdom in the early 19th century. Prior to that time, recreational fishing was a sport of the gentry, who angled for salmon and trout and called them game fish. There was a view that other fish did not make as good eating, and they were disdained as coarse fish. Coarse fish have scales that are generally larger than the scales of game fish, and they tend to inhabit warmer and stiller waters. A large array of baits can be used for a variety of fish. Baits used will vary accordingly to many factors. Some of these deciding factors include the venue being fished, the species of fish being targeted, time of year, and water colour. Also, the options of either moving or still water plays a part in the size, colour or style of bait being used. When fishing on rivers for game fish, i.e. brown, rainbow, brook and sea trout, salmon and in some cases grayling (game status debated), artificial flies, small spinners and lures are a popular choice for many game anglers due to the way they intentionally mimic a fly or small fish on the surface and top layers of the water, enticing the fish into feeding as it sits among actual live flies and fish fry. Both floating and sinking flies and lures can be used to fish either on the surface or in the upper layers of the water. Usually, in summer months, a spinner or fly manoeuvred across the surface will bring about a take from a fish, due to the tendency of fish to move into the warmest part of the water, the surface and first layer (about 18 inches) of water below. When fishing a river for coarse fish species such as chub, barbel, roach, dace and bream, the favourite hook baits tend to be maggot (white, red, and bronze), caster (maggot chrysalis), worm, cheese, pellets (halibut, trout, and carp), boilies (round boiled baits typically made with fish meal, milk, and soya) and luncheon meat. Loose feed can be any of the above baits with a particle bait fed by hand, in a feeder, or by catapult, sometimes in the form of hemp seed, a manufactures fishmeal ground bait. For stillwater fishing and commercial fisheries, a huge array of baits are available. Many of the old favourites are still as potent today as they have ever been. For most species, hook baits such as luncheon meat, bread, sweetcorn, maggot, worm, and pellets will work. When targeting more specific species such as specimen carp, boilies, large pellets, large bunches of maggots, floating baits, large lungworm, tiger nuts, and meat chunks from cat food can work very well. Micro pellets softened along with ground bait can be fed alongside all hook baits mentioned. In the summer months, fish such as carp can be seen feeding off the surface. In this case, a floating dog biscuit or piece of bread floated on the surface can be ideal. For predatory fish, either dead or live bait is usually used in the form of a small fish, such as a live roach. However, many venues do not allow this practice, so dead baiting is usually used for larger predators such as pike, zander, perch and eels. A piece of mackerel bought from a fishmonger can be used as well. Spinning, the use of an artificial lure, is also widely used for predators. These can come in all shapes, sizes and colours, to mimic injured fish and small fast fish. Used at all depths, these can be an exciting method to catch pike and perch. For all anglers in England and Wales, anybody aged 12 and over must purchase a valid rod licence before fishing. This will enable anglers to legally fish in England and Wales for non migratory trout and coarse fish. A single rod licence will enable an angler to fish with up to three rods at any one time. Many specimen carp anglers fish with 3 or 4 rods at once on large lakes to maximise lake coverage and give greater chance of catching. Most commercial fisheries, and some rivers are operated on a day ticket basis. In the UK, these can range in price depending on the venue. They are usually paid on the bank with a representative of the venue collecting the fees from anglers from the peg (fishing spot) at some time during the day, or prior to commencing fishing. In some cases, season tickets can be purchased. Some lakes and river stretches are operated by angling clubs which charge annual membership fees. Application forms can be available from local tackle shops or angling club websites. Waiting lists may indicate the waters operated by the club are sought after can be worth the wait. Other fishing venues can be operated by syndicates where membership is usually by invitation. They can sometimes be joined by contacting a senior member of the syndicate. Depending on the situation, different types of fishing tackle can be used. Most common is the rod and reel, the rod being typically between 8 and 13 feet (4.0 m) long, and manufactured of tubular carbon fibre or splits of Tonkin bamboo. A reel is then attached near the base of the rod to hold a long length of line, which is run to the tip of the rod through eyelets. Once cast out, the line can be retrieved by winding a handle on the reel. However, the use of "poles" is also now widespread. Here, the line is fixed to the very tip of the rod, with no reel used: in order to retrieve the line, the pole itself is taken apart until the line can be swung to hand. Poles are often very long in order to increase the angler's range—up to 16 metres. The main techniques used are float fishing, legering and spinning. In float fishing, the bait is suspended beneath a float made of hollow plastic, wood or quill. The top of the float is usually painted a bright colour and bites are indicated by the top of the float dipping under the surface of the water, or moving up in the water. Legering does not use floats. Instead the bait is held on the bottom of the lake or river by a sinker or large weight. Bites are detected by watching the quiver tip of the rod for movement, or with the use of electronic bite alarms, and more advanced tackle such as PVA bags or mesh. With spinning, either a brightly coloured lure or a small fish attached to a hook is towed through the water to attract carnivorous fish such as pike, zander and perch. Fly fishing techniques may also be used for certain species, such as grayling or chub. For float and leger fishing, groundbait is usually thrown into the water to attract fish to the area. Typical baits include nightcrawlers, maggots, bread and sweet corn. Lately, advancements in technology and market competitiveness have led to many types of other ingredients being introduced, including chemicals, such as betaine, that stimulate the feeding response in fish. Boilies are popular baits for carp fishing. Pleasure angling: describes anglers who go out to enjoy a relaxing day's fishing, and are content to catch whatever fish they can. Match angling: anglers, in teams or as individual entrants, gather together at a venue to catch either as many fish as possible in an allotted period of time, or the greatest total weight of fish. Contests are held at local, regional, national and international levels. Specimen hunting: the aim is to catch a large fish of a specific species. Some specimen hunters will fish only for one particular species, with large carp or pike being popular targets in the UK. A full list of the heaviest fish weights by species, caught on rod and line in the UK can be found at Rod Caught Fish Records UK. ^ Beattie, Rob (2012) Fishing, A Very Peculiar History Andrews UK Limited. ISBN 9781908759856. ^ a b c Bob McDowall. Coarse fish - Cyprinids – goldfish, carp and others, Te Ara - the Encyclopedia of New Zealand. Updated 14 November 2012. ^ Game and Coarse Fishing The Fishing Museum, 2011. ^ "Buy a rod fishing licence - GOV.UK". www.gov.uk. Retrieved 2018-04-17. 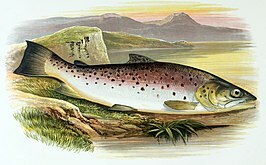 Cholmondeley-Pennell, Henry (1893) Fishing: Pike and other coarse fish 5th edition, revised. Longmans, Green. Cooper, Dave (2004). "First Class Fishing". Fishing Magic. Lowerson, John (1993). Sport and the English middle classes, 1870–1914. Manchester University Press. ISBN 0-7190-3777-8. Tranter, Neil (1998). Sport, Economy and Society in Britain 1750–1914. Page 101. Cambridge University Press. ISBN 0-521-57217-7. Bailey, John (2008). Where to Coarse Fish in Britain and Ireland. New Holland Publishers Ltd. ISBN 978-1-84537-934-6. Marston, Robert Bright (1883) Coarse Fish Culture Clowes and Sons, Limited. Partner, Steve (2007). Coarse Fishing Basics. ISBN 978-0-7537-1586-4. This page was last edited on 14 April 2019, at 06:30 (UTC).